MIL-DTL-901E covers high-impact (H.I.) 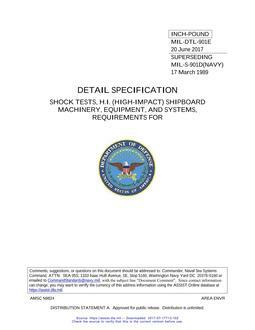 shock testing requirements for machinery, equipment, systems, and structures aboard surface ships, including carriers unless otherwise noted, and submarines, herein referred to collectively as "ships". The purpose of these requirements is to verify the ability of shipboard installations to withstand shock loadings due to the effects of nuclear or conventional weapons or environmental mechanical shock during operation.